The joke in this Midwest state is that people stock up on milk and bread as soon as the forecast calls for bad weather. There’s something about a Missouri snow storm in the forecast that makes me worry about not having enough fresh strawberries. When I found a great supply at my local Aldi’s store, I stocked up. 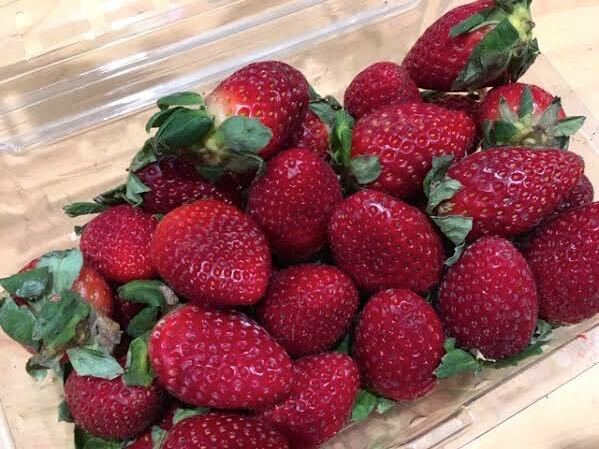 These are smaller, longer strawberries but with great flavor. The challenge is not to let them spoil and that’s quite easy: freeze them. After a good wash and gently drying with a kitchen towel, I cut the strawberries into smaller sliced pieces and placed them on a tray to freeze. Aldi’s produce is from non-pesticide suppliers so the produce is not treated with wax and other preservatives found in other stores. I like freezing the individual pieces so that I can easily choose the size of helping I want while still preserving the rest of the strawberry supply. It’s that easy. Whether its blueberries, blackberries or strawberries, this is a fast and easy way to preserve them so you can enjoy them later. Reminds me of the Strawberry Shortcake dolls that used to be the rage! This cantalope volunteered itself in my berry patch so I gave it an arbor for support. Over the years I’ve heard how hard it is to grow cantaloupes in mid-Missouri. It’s almost as hard as watermelons requiring special sandy flower beds, particular compost and careful handling of their delicate leaves. Although a favorite fruit of mine, I had given up even trying. Then earlier this year I noticed something growing in an old flower bed where I had grown cucumbers last year. I had amended the bed with compost, which apparently included some unplanned seeds. Midway through summer my handyman noted the cucumber was getting a bit wide around the waist. When I got a close up look, it was obvious this fruit was a “good, old-fashioned” cantaloupe. To make sure the fruit was safe as it grew, I tucked a little piece of cardboard underneath and wondered who would get to the ripe fruit first, “Cousin George” the raccoon or I. 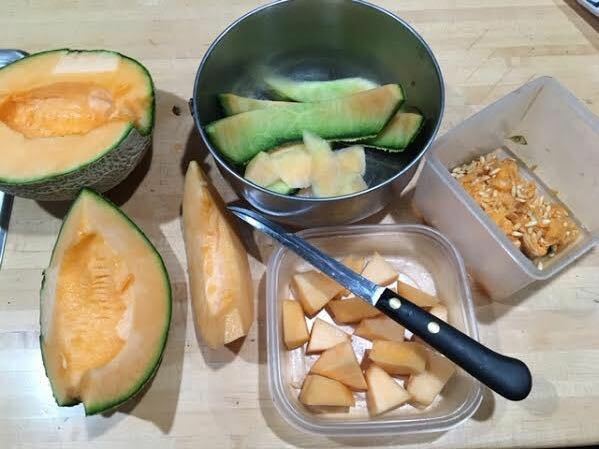 Cutting up my first ever homegrown cantaloupe into bite-sized pieces. Yey, I beat Cousin George to this cantaloupe. I cut into it about 5 minutes after it was checked for a sweet smell on the bottom, a sign it is ripe and ready to pick. This dark spot on the bottom was only on the surface and was easily removed. Once in my kitchen and sliced, I was delightfully surprised at how it tasted. It was surprisingly rich, a nice change from the pre-frozen fruit we often get at our local grocery stores. Another cracked spot on the bottom was cut out for easy slicing. 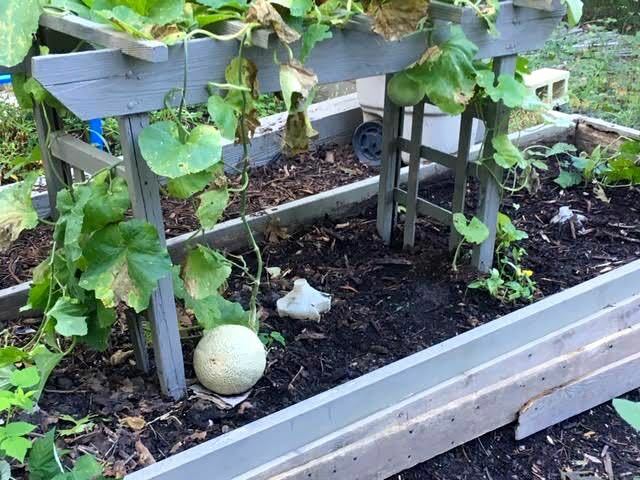 So how to grow cantaloupes? 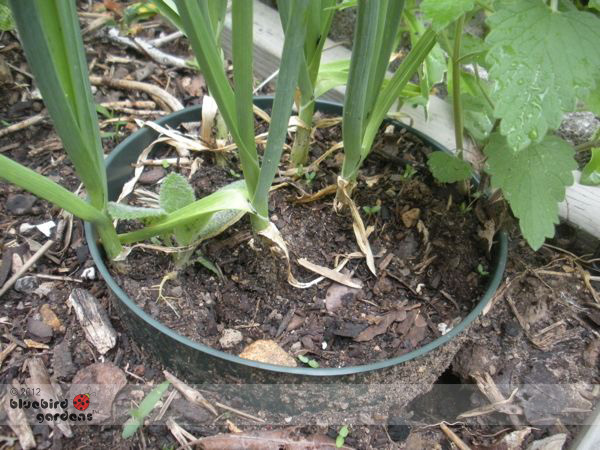 Save the seeds and toss them in a flower bed corner that has been amended with aged compost. Having an old trellis handy helps to keep the leaves damaged from growing on the ground and keeps them safe from garden visitors like the rabbits I often see visiting the area. Then mark your calendar to try to beat wildlife to the ripe fruit. Tomato season is almost here so this is a good time to talk about the easiest way to save some of the wonderful summer tomato flavors out of our gardens for the upcoming winter. 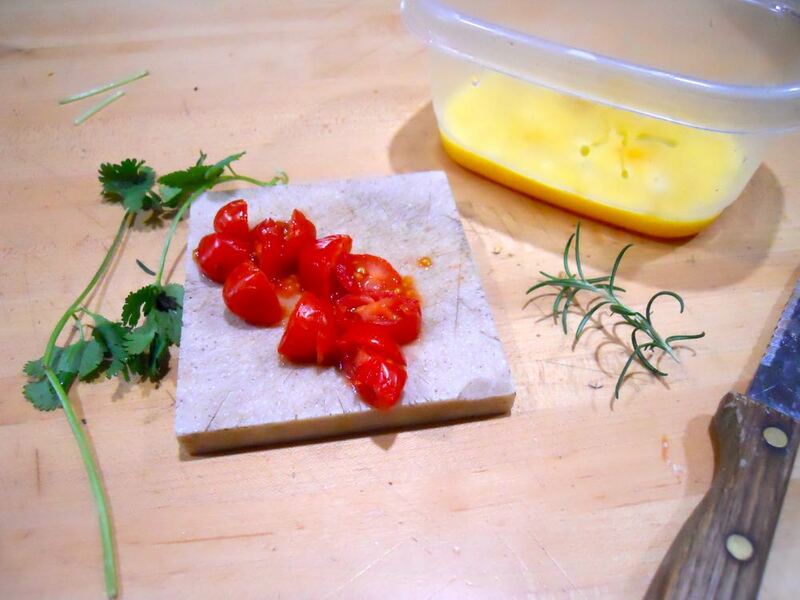 Tomatoes made a wonderful base for chili, soups and sauces. Chili is my favorite dish to cook mid-winter using some of my saved summer tomatoes. Soups are second so whatever tomatoes I save, they will both become smashed in the cooking process. The first step is to pick wonderfully tasty tomatoes that are ripe and ready to use. After washing and letting them drip dry on a towel, I cut them into quarters and place in a tray that fits in my freezer. A couple of hours later, when they are individually frozen, I toss them into a good quality freezer bag and return them to the freezer for winter use. If I remember, I will mark on the bag when I froze them and what kind of tomatoes they are. Considering that most of my tomato plants are volunteers that sprout early spring in my inside plant pots, most of them are of the mystery variety. Friends of mine go through the canning process but I find this much quicker and easier to do. One way to decorate a food jar, use counted cross stitch top with makers initials for pincushion. Every year, I am blessed with friends who share their homegrown produce in jars. It's a wonderful treat in the middle of a cold winter, and I have a tendency to save them for a special day. Instructions to tuck under the fabric top of a food jar on how to make the jar into a pincushion. Talk about recycling, the instructions are how to turn the food jar into a 10-minute pincushion! Now I recycle jars for a variety of things: to store buttons, seeds, pins, dried coffee grounds for my roses, fresh dried catnip and cat toys getting refreshed - what a great idea for another practical use after enjoying the special treats the jar originally carried. A 6-inch fabric round is perfect to transform a pickle jar into a pincushion. I haven't turned the jar into a pincushion yet, will do that later after the holidays but wanted to share the idea with you now. Great little gift idea, don't you think? They were everywhere when I worked at the 1992 Earth Summit in Rio de Janeiro, Brazil. I suspect they are also keeping athletes and their families company during the 2016 Summer Olympics. In 1992, I was the media advisor to the US Delegation to the United Nations’ conference, the first time all countries in the world had come together to try to agree on how to deal with our rapidly changing climate and related issues. It was a highly politically-charged environment. Soldiers lined the sidewalks to our hotel and conference center, and at one point I was wearing 18 access identification badges. One of my favorite scenes from the Earth Summit in Rio, Amazon Indians seeing computers. During our time off, a few of us visited some of the nearby fresh markets, especially on the weekend, and ran into vendors with carts loaded with watermelons. They would cut them up, juice, add ice and hand over a cold glass of summer. I grew up some 180 kilometers north of Rio, on an island literally off the Atlantic Coast. I have very fond memories of monkeys in our backyard. now extinct; chasing lobsters at the beach across the street, and teaching parrots to sing. Don't be too impressed, it would have helped if I could have carried a tune myself. Amidst those wonderful recollections are not ones of a love affair with watermelon juice. Not that it should be any surprise someone came up with a way to profit from this special treat, who hasn't had to change clothes after eating an especially-delicious piece of juicy watermelon? · Cut the watermelon into wedges and remove the flesh from the green skin. 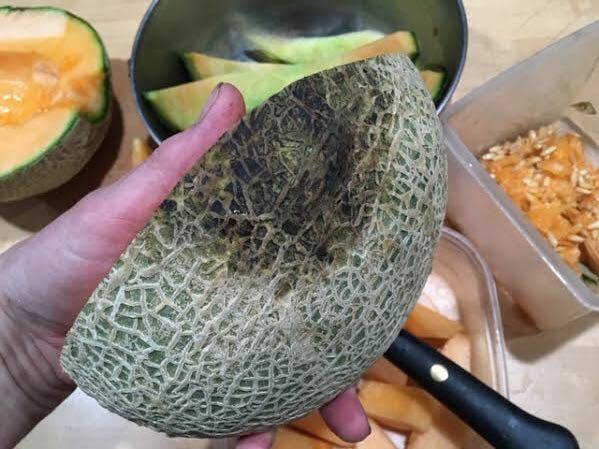 · Cut it into small pieces, removing as many seeds as you can or better yet, buy a seedless watermelon to start. · Put the watermelon chunks in the refrigerator until it is very cold. · Blend the watermelon chunks to a liquid. · You can either add sugar or honey to make it sweeter. · Pass the juice through a not fine sieve into a pitcher. · Add ice cubes and serve immediately. One of the ways we used to test watermelons for ripeness was cutting a triangle in the side. · Pick out a nicely-ripe seedless watermelon. Now I do remember how my parents would select a ripe watermelon. The vendor would cut a little triangle in the side so they could check the fruit ripeness. Those days are gone, I'm told farmer's markets rules today don't allow for open fruit. · Place in refrigerator to cool. Watermelon balls made with a melon baller come in handy as a quick desert. Cut in half. Using a melon baller, remove the inside of the watermelon with a melon baller and place watermelon balls in container. The nice thing about watermelon balls is that they are convenient to easily make watermelon juice. They can also be used for a quick desert or a refreshing treat on a hot summer day. Less mess, too! Watermelon juicing requires these utensils and a blender if you need more than a couple of cups. · Pour watermelon juice out of container through a strainer. This is important if you really just want the juice without watermelon chunks. If you've collected most of the juice, there should be enough for a couple 8 ounce cups of juice without dragging out the blender. Any available strainer will work to remove chunks of watermelon from the juice. Actually after straining, I added a watermelon ball to my glass. Go figure! · To make more, blend watermelon balls in a blender. Pour through sieve. · Add ice. Serve immediately. · If you want to experiment, add a little ginger, a sprig of spearmint or a splash of lime to a serving. 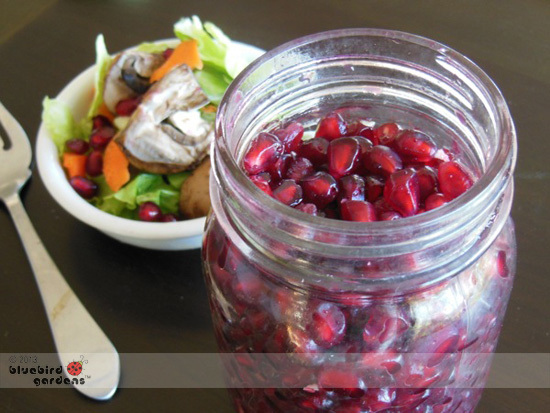 · If you decide to store for later use, know the juice separates so you will need to mix together again before serving. Freezing blueberries individually makes them easier to serve later. June is blueberry-picking time in Missouri. There are several pick your own farms around where I live so anyone visiting me during these weeks can count on a trip to pick some. Although some silly people - like one of my brothers who shall remain nameless to protect the guilty - worry about only picking what they can immediately eat, I don't believe there is such a thing as too many blueberries. What we don't eat fresh I freeze for enjoyment later, especially in the middle of winter. I have several trays that fit my little door freezer so find one that works well with your freezer. A cookie sheet with raised sides will work, or even a pie or cake tin. 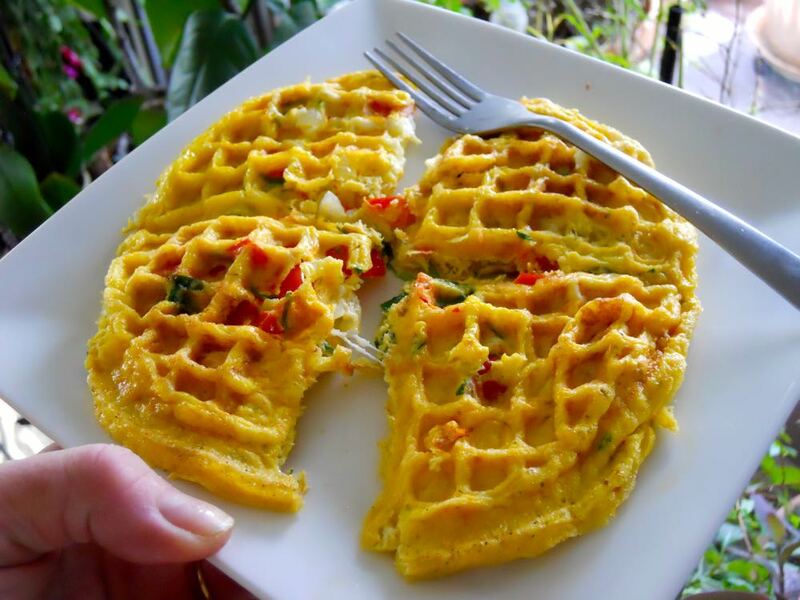 This is something that little hands can help you do so invite kids into the kitchen with you. Don't count the blueberries, some may inadvertently disappear in the process. After washing and drying the blueberries, spread them into a single layer on the tray and place in freezer until frozen for several hours. Once frozen, store in a freezer bag for easy individual berry retrieval later. Having the berries frozen like this makes it easier to grab a handful for cereal or to spread in a salad. This applies to almost anything else you want to freeze. 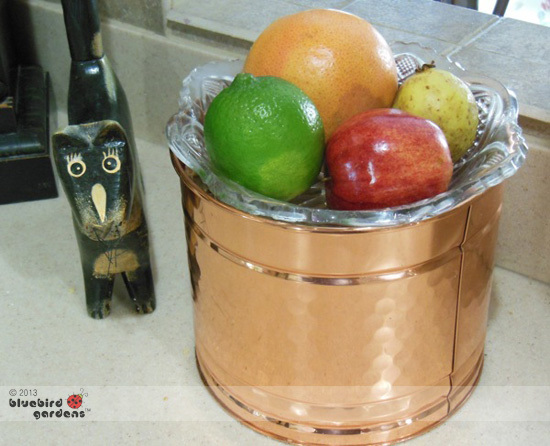 Once you get the system down, it will be easy to preserve extra fresh fruit for enjoyment during the off season.